In one respect, a focus on saving diminishes the importance of investing. A dollar saved through a more conscious spending plan is a far more certain return than the uncertain return on an investment. Said another way, savings is the best investment an individual can make. Said differently, a higher savings rate is a much easier and more certain way to generate additional capital than the elusive search for alpha. There are too many smart fund managers out there searching for an incremental edge to make the hunt for alpha anything but frustrating to the average investor. The challenge for investors today is that the financial world is wacky. In big chunks of the world the yield on government bonds is negative. In the US, Treasury yields are at all-time lows. And the yield on the S&P 500 now easily exceeds that seen on the 10-year Treasury. So not only are historical relationships all messed up. The absolute level of expected returns are low as well. 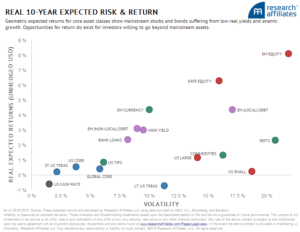 As you can see below it is nearly impossible to find a US-based asset with 10-year real expected returns in excess of 1% per annum. “Investing is always a partnership between you and the markets,” says Mr. Kinniry. In the 1980s and 1990s, when stocks and bonds alike racked up double-digit average returns, the markets did most of the work. “But now you are going to have to be the majority partner,” he says. In this weird world, if you want to have more money, you will need to save a lot more money. It may not be what most investors want to hear but it is a rational response to a seemingly irrational world. You can support Abnormal Returns by visiting Amazon, signing up for our daily newsletter, liking us on Facebook or following us on Yahoo Finance, Medium, StockTwits and Twitter.